There are few guys who don’t aspire to one day own a walk-in wardrobe filled with every type of suit, but we’re often in the dark as to how to get there. For the remainder, suits are a necessary evil: an insurance policy for professional and social occasions that you want to spend the bare minimum on. Whichever camp you fall into, allow us to illuminate you. This is the FashionBeans guide to building a tailoring wardrobe. Not in the IKEA sense, more along the lines of what to buy, and in what order, to most economically cover your event bases and get maximum bang for your sartorial buck. The tailoring equivalent of the little black dress, if you buy just one type of suit, make it a plain navy two-button with a notch lapel. You won’t get more use out of anything else. Weddings, job interviews, err, court appearances, it’s got you covered. Especially if you choose a mid-weight fabric – around 11-12oz – so that you can wear it all year round. Don’t be swayed by high ‘Super’ numbers – a measure of the material’s fineness. ‘Super’ sounds good, but they’ll also wrinkle more, making them unsuitable for daily use. ‘Fine’ also means ‘delicate’. So if this is your first – or only – suit, then you’re likely to blow through it after a couple of months of continuous wear. Stick instead to around the 100 mark for a sound mix of affordability and durability. A textured fabric, like a hopsack, birdseye or even a light flannel, enables you to wear the jacket and trousers as suit separates with the rest of your wardrobe. (This does not, however, work with generic shiny worsted wool, so don’t try it. Ever.) Details like patch pockets and contrast buttons help in this regard, although they’ll also make the suit slightly more smart-casual. The other type of tailoring workhorse. The cavalry. Just when your navy suit was about to give up the ghost (or just head to the dry cleaners), grey rides to the rescue, ready to make you look good. As a general rule, charcoal skews formal and wintry, while light grey is more casual and summery. A mid-grey will give you the most scope for day-in, day-out, year-round wear. Ideally, you want to choose a shade – and fabric – with mileage, such that you can wear the trousers with your navy jacket and vice versa. Until the foundations of your suit wardrobe are in place, avoid patterns like a plague of ravenous cashmere-chomping moths. Nobody will notice that you wore the same navy or grey suit for two or three days out of the week. Whereas nobody will miss you repeating a Prince of Wales check. It’s at this point that American style guides (and others based in more forgiving locales) would recommend a summer-ready suit in lightweight khaki cotton. However, for those in less forgiving climes, there are more pressing issues. Instead, now is the time to make a case for a muted, double-breasted type of suit as your dark horse: specifically, an almost-black grey, or navy that’s close to midnight blue, maybe even in a fabric with a bit of a sheen, like a mohair, and with peak lapels. The reason? A dark ‘DB’ is versatile enough to enter your everyday rotation. But with the shape, sheen and sharp lapels, it’s also got a bit of swagger about it for those times you need to wear a suit but don’t want to look like you came straight from the office – e.g. cocktail attire invitations and weddings. Just make sure the cut is trim and not too long in the jacket. Black tie invitations may be few and far between — as infrequent as one a year, even — but they will come, with increasing regularity as you get older. And when they do come, they’re invariably for occasions when you want to look and feel at your top: a swanky work party, a wedding, a long-overdue Oscar nomination for Best Actor. They’re not times when you want to don an ill-fitting hire suit that reeks of the soaked-in sweat of a hundred other uncomfortable men before you. If buying off-the-peg, you could get your money’s worth after as few as two or three wears (bespoke will require considerably more wears). And look at it the other way, how often could you wear a dinner suit? Instead of fudging those ‘black tie optional’ invitations, you could boss them. You could don ‘black tie creative’ for parties even when the invitation doesn’t call for it. If the jacket is cut slim and a tad short, you could even wear it with jeans and a T-shirt on a night out. The point is that if you have a great tux that fits you like a (possibly velvet) glove, then you’ll find excuses to wear it. And you’ll probably get a lot more invitations as a result. It’s common knowledge that a pair of swim shorts goes far better with the summer season than a suit. However, that’s not to say the warmer months don’t cater for the man who needs to dress with a touch of formality. The trick to staying cool when the weather’s not isn’t just in choosing the right type of suit, but the right textiles. 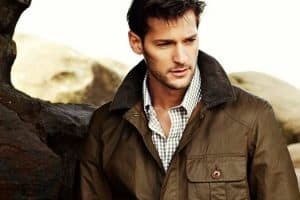 Tightly woven fabrics such as twill and artificial fibres may be less prone to creasing, but they restrict the amount of air that can circulate through the garment, making ultra-lightweight open-weave linen, seersucker or hopsack a far better choice. It’s also wise to pay attention to construction. Slightly relaxed-cut, unstructured jackets not only remove the sweat-inducing insulation of padding and linings, they also speak more to the Riviera spirit of summer, as do earth and pastel tones, which never fail to look good next to tanned skin. Though it might not be the most pertinent type of suit to purchase, few things promise to supercharge a sartorial rotation like a check. Be it a tartan, Tattersall, Prince of Wales, windowpane or houndstooth (and breathe), an all-over pattern is one surefire way to stand out from the suited crowd. Of course, just because your two-piece is checked, doesn’t mean it has to be in everyone’s face. Aside from opting for more subtle patterns in tonal colours, wearing the suit as separates – say, a Prince of Wales check blazer with black trousers – is an easy way to make a statement without straying into peacock territory. As for pulling off the look as a whole (you maverick, you), the most important thing is to make sure the suit is cut sharper than David Gandy’s jawline, then simply pair it with a solid shirt and tie and you’re ready to join the menswear big leagues.